Objective To assess the level of agreement between common definitions of wound infection that might be used as performance indicators. Setting London teaching hospital group receiving emergency cases as well as tertiary referrals. Participants 4773 surgical patients staying in hospital at least two nights. Main outcome measures Numbers of wound infections based on purulent discharge alone, on the Centers for Disease Control (CDC) definition of wound infection, on the nosocomial infection national surveillance scheme (NINSS) version of the CDC definition, and on the ASEPSIS scoring method. Results 5804 surgical wounds were assessed during 5028 separate hospital admissions. The mean percentage of wounds classified as infected differed substantially with different definitions: 19.2% with the CDC definition (95% confidence interval 18.1% to 20.4%), 14.6% (13.6% to 15.6%) with the NINSS version, 12.3% (11.4% to 13.2%) with pus alone, and 6.8% (6.1% to 7.5%) with an ASEPSIS score > 20. The agreement between definitions with respect to individual wounds was poor. Wounds with pus were automatically defined as infected with the CDC, NINSS, and pus alone definitions, but only 39% (283/714) of these had ASEPSIS scores > 20. Conclusions Small changes made to the CDC definition or even in its interpretation, as with the NINSS version, caused major variation in estimated percentage of wound infection. Substantial numbers of wounds were differently classified across the grades of infection. A single definition used consistently can show changes in percentage wound infection over time at a single centre, but differences in interpretation prevent comparison between different centres. The UK government is changing the way postoperative infections are monitored in the NHS. Surveillance of surgical site infection, still commonly referred to as wound infection, became mandatory for orthopaedics in April 2004, and this will soon spread to other specialties.2 The feedback of infection data to surgeons clearly reduces infection rates.3 4 Given that the percentage of wounds classified as infected will probably be used as a performance indicator,5 it is vital that the new surveillance system allows reliable comparisons across NHS institutions, and with overseas health institutions. Although the UK Department of Health has consulted with experts, it has given little guidance on the definition of surgical site infection that is to be used for surveillance in England, namely the nosocomial infection national surveillance scheme (NINSS) version of the definition set out by the Centers for Disease Control (CDC) in 1992.6 There has been little or no critical evaluation of either the original or modified definition. Moreover, the version or interpretation of the definition used varies between hospitals and regions.7 8 Choosing an appropriate definition and ensuring that the definition is applied consistently are necessary conditions for observed rates of wound infection across hospitals to be valid. Designers of a national surveillance system must judge the available definitions by their ability to identify infections that matter most to patients and to health services. The practicability of collecting the required information must also be considered, since laborious or complex definitions are less likely to be implemented consistently across hospitals. We therefore compared agreement between four common definitions of surgical site infection—namely (a) the CDC 1992 definition, (b) the NINSS modification of the CDC definition, (c) the presence of pus, and (d) the ASEPSIS scoring method9—applied to the same series of surgical wounds. We also compared the percentage of infection based on the CDC definition and on the NINSS modification to investigate the potential effect of subjective CDC criteria and of variation between hospitals in data collection methods. For purposes of comparison, we classified ASEPSIS scores > 20 as infected. ASEPSIS scores of 10-20 (“disturbance of healing”) are known to describe some infections, but most reflect wound breakdown due to other causes.11 Moderate to severe infections score > 30. The CDC definition also describes the severity of infection, classifying infections as “none,” “superficial,” or “deep or organ space” (termed “deep” in this article). Both definitions purport to describe the importance of an infection with respect to the patient's morbidity and the likely clinical consequences. Surveillance staff assessed patients every two or three days by direct observation, case note review, and questioning of the nurses caring for the patients. We contacted patients by post or telephone one to two months after their operations to complete a questionnaire designed to ascertain late infections. Thus, we followed up patients either until their wounds had healed without infection or until an infection was detected, but the precise duration of follow up varied depending on patients' length of stay in hospital and when they were contacted to ascertain late infections. We therefore classified wounds as infected or not and recorded the proportion of wounds classified as infected at any time during follow up. Information collected was entered into an Access database, but microbiological results and demographic and some operative information came directly from interface with other computer databases. We gave quarterly reports of wound infection to surgeons. A total of 5804 surgical wounds in 4773 patients were assessed during 5028 separate hospital admissions to all surgical specialties in the hospital group between May 2000 and July 2003 (table 1). The patients' median age was 53.5 years (interquartile range 37.5-69.6), and 2281 (48%) of the patients were female. The median hospital stay was 8 days (6-14), and duration of operation 111 minutes (62-180). The mean percentage of wound infection differed substantially with the different definitions; 19.2% (95% confidence interval 18.1% to 20.4%) with the CDC definition, 14.6% (13.6% to 15.6%) with the NINSS version, 12.3% (11.4% to 13.2%) with pus alone, and 6.8% (6.1% to 7.5%) with an ASEPSIS score > 20. Table 2 shows the level of agreement between the ASEPSIS and CDC systems. When superficial infections (according to CDC category) were included, 13% (778) of all observed wounds received conflicting diagnoses, and 6% were classified as infected by both definitions. When superficial infections were excluded, the two definitions estimated about the same overall percentage infection (6.8% and 7.0% respectively), but there were almost twice as many conflicting infection diagnoses (n=371) as concordant ones (n=215). 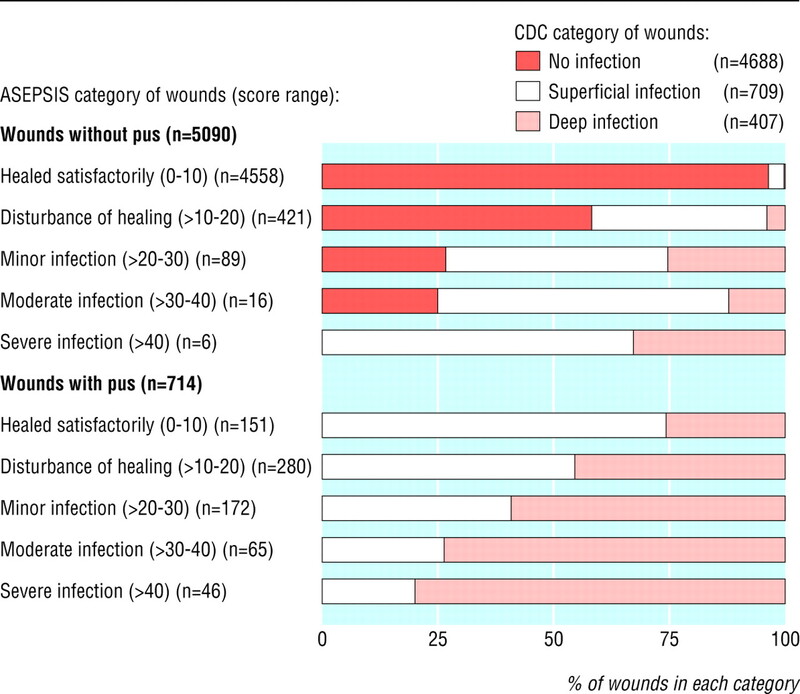 Wounds with pus were automatically diagnosed as infected by the CDC, NINSS, and pus alone definitions, but only 39% of these (283/714) had ASEPSIS scores > 20 (fig 1). For these wounds, the CDC scale also consistently diagnosed greater infection severity than did ASEPSIS. Most wounds with pus were classified by ASEPSIS as having a “disturbance of healing” (39%, 280/714) or as healing satisfactorily (21%, 151/714). Of these latter 151 wounds, 26% were classified as deep infections by the CDC definition. In wounds without pus the relation of ASEPSIS and CDC scales was less consistent (fig 1). For example, 42% (177/421) of wounds classified only as “disturbance of healing” by ASEPSIS were classified as infected by the CDC definition, with 3.8% (16) classified as deep infections. Conversely, four of the six wounds classified as “severe wound infections” by ASEPSIS were classified as superficial by the CDC definition. Figure 2 compares the wound classification with the CDC definition and with the NINSS version. Each category of infection showed unique discrepancies between the two definitions. For example, more than 30% of wounds defined as superficially infected with CDC were classified as not infected with NINSS (229/709). In the CDC “superficial infection” category 94% (222/237) of the observed discrepancy was attributable to the NINSS modification of the CDC criterion related to positive bacterial cultures. In the CDC “deep infection” category the discrepancy observed was due to the exclusion of infections based solely on a surgeon's diagnosis. We compared four different definitions of surgical site infection and found that they varied widely in the estimated percentage of wounds infected. Comparing the 1992 CDC definition and the ASEPSIS scoring method, we found more than twice as many wounds were classified as infected by only one definition (n=778) as were classified as infected by both (n=366). We made some assumptions in applying the definitions, but these are unlikely to explain the extent of the discrepancies observed. For the CDC definition, we often assumed the requirement for a surgeon's diagnosis of infection to be satisfied when a decision was made to start specific antibiotic treatment or to provide surgical treatment. For example, opening of a wound under general anaesthetic for drainage of pus was taken to indicate deep infection. In other studies, differences in results between CDC and other surveillance methods have been associated with lack of follow up, use of positive culture results, or clinical criteria.13 Although our study was conducted in a single group of hospitals, data came from multiple sites, many surgical specialties, and a large number of surgeons, so that most of the relevant sources of variation were represented. Both the CDC and ASEPSIS definitions describe the severity of wound infections—CDC describing three categories (none, superficial, or deep), whereas ASEPSIS has scores up to 50 or more. The CDC definition consistently tended to rate wounds with pus as more severely infected than did ASEPSIS. CDC also tended to rate wounds without pus as being more severely infected than did ASEPSIS, but some wounds classified as moderately or severely infected by ASEPSIS (31-40 points and > 40 points respectively) were classified as not infected or only superficially infected by CDC. The criteria needed to satisfy the CDC definition are complicated, and some are subjective. They were modified in the English NINSS version of the CDC definition to make it practicable in a hospital setting.7 However, the equivalent Scottish surveillance system adopted the original CDC definition.8 Unfortunately, none of the methods of determining wound infection has been validated against outcomes that it would be expected to influence, such as length of stay of hospital inpatients or prescription of antibiotics after discharge. Therefore, choosing an optimal definition is extremely difficult. A definition that is too sensitive will give rise to high estimates of infection rates and may cause public alarm. Moreover, if overall rates are influenced primarily by minor infections of relatively little consequence to patients and health services, the use of such a definition could mask important differences between institutions. In contrast, a definition that lacks sensitivity would not identify infections that are avoidable. An agreed definition needs to capture all infections of clinical importance and be accepted by patients, doctors, and managers. Other health outcome measures have been psychometrically evaluated,14 but similar information is lacking for most definitions of wound infection.15 ASEPSIS in its original form was reported to be repeatable and related to outcome,11 16 but it has since been modified and reproducibility is currently being reassessed. The absence of a clear pattern to the type of wounds classified as infected by CDC but as not infected by NINSS supports the view that the CDC criteria responsible for the discrepancy are difficult to apply consistently. Small changes made to the CDC definition or even to its interpretation, as with the NINSS version, causes substantial variation in the apparent percentage of infected wounds. This lack of robustness is disquieting, because the elaborate and labour intensive CDC definition would probably need to withstand similarly varied adaptations in any nationwide surveillance programme.8 Although the CDC definition has been adopted in many countries to allow international comparison, this faith seems unwarranted. Surveillance systems that monitor rates of wound infection and provide feedback to clinicians have been shown to contribute to quality improvement and are acknowledged as an important component of local programmes to prevent and control infection.3 4 10 17 Indeed, we recorded reductions in infection rate in our own programme after giving feedback to surgeons. Provided the same definition is used over time, any changes recorded should be accurate.18 However, using wound infection rates as a performance indicator to compare centres or countries is premature. Without a means to interpret absolute rates, such comparisons will be compromised by discrepancies in the way that infections are defined. External agencies should not judge the quality of medical care on these measures.19 Comparative performance tables should be reported only once a scientifically based and agreed definition has been produced. We thank the members of the wound surveillance team (D Archibald, J Leach, and E O'Donnell). Contributors APRW planned and supervised the study and drafted the paper. BH was in charge of the data collection. BCR and CG were responsible for statistical analysis and helped to write the paper. DP and ML constructed and maintained the database. ZHK and JB helped to write the paper and to apply the definitions of infection. JW and AP helped to write the paper and to apply the NINSS definition. APRW is guarantor for the study. Funding Wound surveillance was supported by a start up grant from UCLH trustees for the first two years. Subsequently it has been funded directly by UCLH Trust. The analysis by CG reported in this paper has been funded by a grant from the National NHS R&D Research Methodology Programme. None of these funding sources have contributed to, or influenced the interpretation of, the analyses reported. Ethical approval This was not deemed necessary as the surveillance was part of the hospital audit programme.
. The socio-economic burden of hospital acquired infection. London: Public Health Laboratory Service, 1999.
. Surveillance of healthcare associated infections. PLCMO2003/4, PLCNO2003/4 London: Department of Health, 2003.
. Surgical wound infections: prospective study of 4,468 clean wounds. Infect Control 1987;8: 277–80.
. Decreasing the incidence of surgical wound infections. Validation of a surveillance-notification program. Arch Surg 1986;121: 458–61.
. Indicator 23003. In: NHS performance indicators: a consultation. London: DoH, 2001: Annex 1, p 57.
. CDC definitions of nosocomial surgical site infections, 1992: a modification of CDC definitions of surgical wound infections. Infect Control Hosp Epidemiol 1992;13: 606–8.
. A user evaluation of the nosocomial infection national surveillance system: surgical site infection module. J Hosp Infect 2002;52: 114–21.
. The measurement and monitoring of surgical adverse events. Health Technol Assess 2001;5(22): 1–194.
. A scoring method (ASEPSIS) for postoperative wound infections for use in clinical trials of antibiotic prophylaxis. Lancet 1986;i: 311–3.
. The epidemiology of wound infection. A 10-year prospective study of 62,939 wounds. Surg Clin North Am 1980;60: 27–40.
. Statistical methods in medical research 4th ed. Oxford: Blackwell, 2001: 703.
. Comparison of wound scoring methods for use in audit. J Hosp Infect 1998;39: 119–26.
. The use of statistical process control methods in monitoring clinical performance. Int J Qual Health Care 2003;15: 445.
. Comparison of two surveillance methods for detecting nosocomial infections in surgical patients. Eur J Clin Microbiol Infect Dis 2002;21: 444–8.
. The chronic pain grade questionnaire: validation and reliability in postal research. Pain 1997;71: 141–7.
. Postoperative wound scoring. Biomed Pharmacother 1989;43: 669–73.
. Repeatability of asepsis wound scoring method. Lancet 1986;i: 1208–9.
. Feeding back surveillance data to prevent hospital-acquired infections. Emerg Infect Dis 2001;7: 295–8.
. Use and misuse of process and outcome data in managing performance of acute medical care: avoiding institutional stigma. Lancet 2004;363: 1147–54.